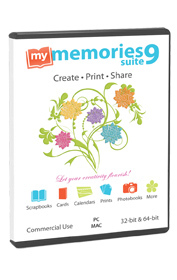 My Memories Suite Version 9 digital scrapbooking software is a fun and creative way to create scrapbooks, photobooks and more, whether you have a Mac or PC. The software's design tools will help you to build entire albums and other printable projects effortlessly using one of the many installed templates or designing your very own pages from scratch. Available worldwide. Intended for English-language computers. Technical support is English-only. 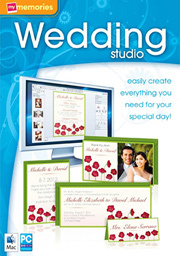 Create your own high-quality professionally printed wedding invitations, thank you notes, and more. Choose from a wide array of popular new styles and customize to give them your own personal flair. Wedding stationery can be printed at home or uploaded for professional printing on the highest quality paper and shipped to your door. 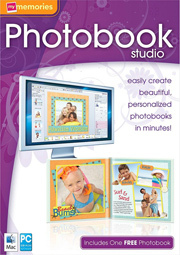 Create professional quality photo books with design software that's perfect for preserving your memories. It's easy to get started with quality templates and clip art, just add photos and upload to have professionally printed and bound hard- and soft-cover books printed and shipped right to your door.